*Valid for agents who visit one of the homes shown on this flyer and online between January 19, 2019 and February 8, 2019. Must visit one of the homes, tour, and drop your business card with one of our Peggy Slappey Properties onsight agents. Drawing will be held on February 11th, 2019. 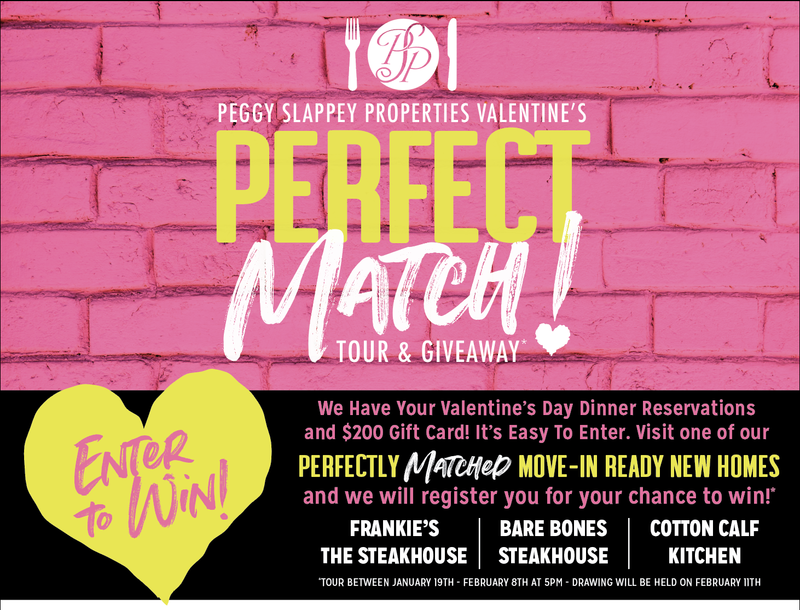 Winners will be annouced on the Peggy Slappey Properties Facebook page - www.facebook.com/peggyslappeyproperties.com. Winners will need to pick up gift cards no later than 4pm on February 14th, 2019. Changes to reservations times can not be changed. Please contact Peggy Slappey Properties onsite agent for full details. Cannot be combined with any other offers. All information is believed to be accurate but is not guaranteed and subject to change without notice.